Railway Recruitment Board has extended the last date for RRB Ministerial & Isolated Category Recruitment 2019 till April 22, 2019. Candidates who want to apply for the posts can visit the official site of RRBs and apply for it. This recruitment drive will fill up 1665 posts in Indian railways. Earlier, the last date to apply was till April 7, 2019. Candidates can pay fees through online mode till April 28, 2019. The final submission of application will be till April 30, 2019. As per the previous official notification, the computer-based test (CBT) will be conducted between June – July 2019. The posts to be filled up through this recruitment drive are Junior Stenographer - Hindi, English, Translator, Cooks, Welfare Inspector, Teacher, Law Assistant, etc. The selection process will encompass Single Stage Computer Based Test (CBT) followed by Stenography Skill Test (SST)/Translation Test (TT)/Performance Test (PT)/Teaching Skill Test (TST) (as applicable) and document verification and medical examination thereafter. Candidates can download their call letters from the official sites after the release. 1. Candidates are required to apply online on any of the regional RRB website. The direct link to apply for RRB Ministerial and Isolated Category Recruitment 2019 would be provided here one activated. Candidates are required to apply online on the official regional websites. All the candidates are advised to carefully go through the official notification for RRB Ministerial and Isolated Category Posts 2019 before filling the online application form. Candidates can apply for only one regional RRB. Also, candidates who are still appearing for their respective qualifying examinations cannot apply. Step 1: Go through the detailed CEN 03/2019 to satisfy that you are eligible to apply. Step 7: Candidates are not required to send any filled application forms. However, all the applicants are advised to take a print out of the application form once complete and keep it safe for future purposes. 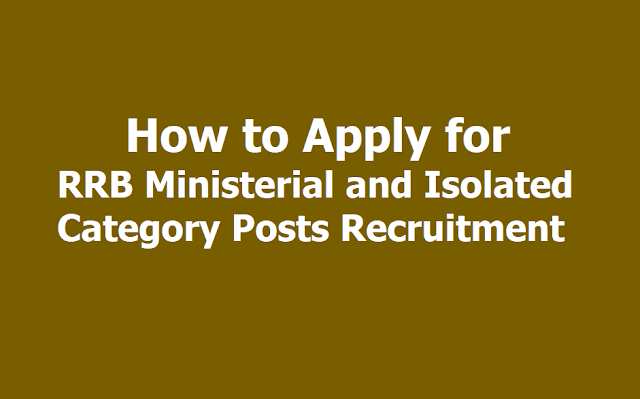 Online application for RRB Ministerial and Isolated Category Posts closes on April 22, 2019.